On Eternal Patrol - Freeman Paquet, Jr. The Navy Cross is presented to Freeman Paquet (2071961), Gunner's Mate First Class, U.S. Navy, for gallantry and intrepidity in action while serving aboard the U.S.S. HARDER (SS-257) on the Fourth War Patrol of that submarine during the period 29 March 1944 to 20 April 1944, in enemy controlled waters of the Pacific Area. On 1 April 1944, during that war patrol, Gunner's Mate First Class Paquet served as a member of a volunteer rescue team dispatched from the HARDER to an enemy held island to rescue a naval aviator whose plane had been shot down. Although fully aware that unforeseen circumstance might result in the forced abandonment of the entire party, Gunner's Mate First Class Paquet courageously fought his way through the breakers and a coral reef despite dangerous hostile sniper fire and locating the exhausted aviator, succeeded in bringing him back to Harder. 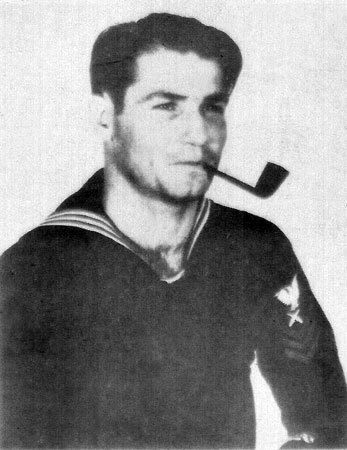 His conduct throughout this action reflects great credit upon himself, and was in keeping with the highest traditions of the United States Naval Service. Paquet Hall on the (former) U.S. Submarine Base in Pearl Harbor was named in his memory.